In August Kate wrote a great review of the fashion site Modcloth. Continuing on our "outing of awesome companies" trend I wanted to draw attention to some of the great things going on at Appliances Online. 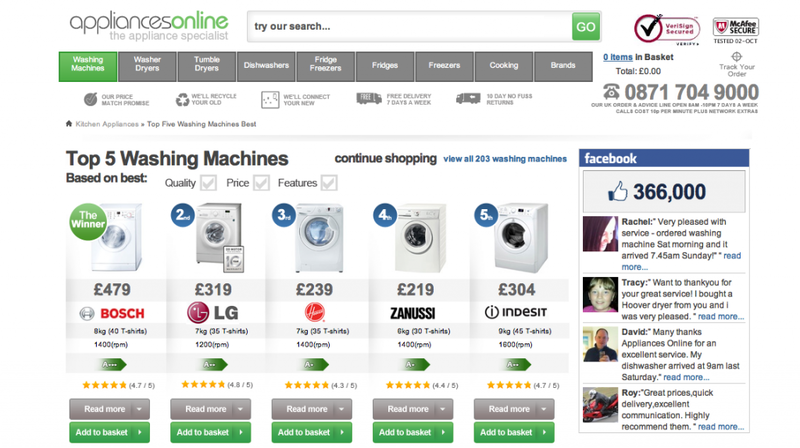 Appliances Online does what it says on the tin—it's a place to buy white goods online. I first came across their site when shopping for my own new appliances and was so impressed by my experience with their site, I was inspired to write this post. Their site has a clean design and fantastic category pages that really think about how their customer will be shopping for a new product. They have created Top 5 lists, have video shopping guides, and have used lovely large images to make the whole experience more pleasant. Their social media activity is also extremely impressive with some of the best Facebook comments from customers I have ever seen. ...and those are just a sample! Apparently, it's not just me who thinks they are amazing. In the past year they have seen a 50% year on year increase in sales. With a market that only grew by 2.5% in 2011, Appliances Online's growth is way ahead of industry trends. Looking at a search metrics report its also clear that their team is hard at work to increase the visibility of the site. To help me really understand how Appliances Online is "changing the face of white goods retailing", I reached out to their team for an interview. I was put in touch with the incredibly nice Matthew Lawson, who is their Head of Conversion. He was able to shed some light on what his team has been working on and what makes them so great. CK: Could you tell me a bit about the success of Appliances Online and some of the results you have seen from online marketing? 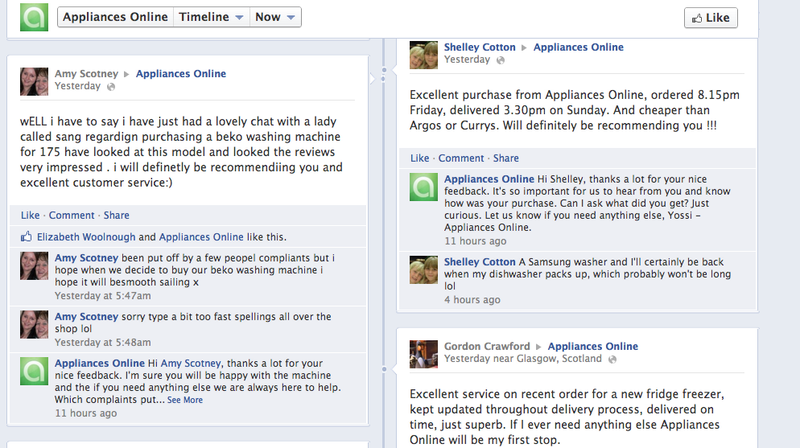 ML: Appliances Online have had a great few years and we have seen some fantastic growth. From May 2010 to May 2012 we went from Appliances Online not being in the top 60 most visible white goods websites, to becoming the 2nd most visible organically. May I also add we are consistently 1st or 2nd in paid search for visibility which is all done in house. I am very proud of my team and what they have been able to achieve in making our site more visible. However, as Head of Conversions I'm even happier that the growth we have seen in search has translated into real business wins and an increase in sales. To me that is the real test of a successful digital strategy. CK: Could you tell me a bit of background on Appliances Online and what has influenced your current digital strategy? ML: Our customers have been (and will always continue to be) the main influence on our digital strategy. Two years ago we had a really good online catalogue with hundreds of products and unique product descriptions. We had invested into strong information architecture and the site was set up well. However, as an online only retailer selling good that consumers were hesitant to buy online, we knew we needed to work hard to keep customers on the site and encourage them to buy their appliances from us. So we started thinking about the customer journey and we did some research asking UK consumers, "why aren't you buying white goods products online?" The main reason they gave us was that they had a lot of questions at the research stage that weren't being answered by websites. While they would usually start their research online, they couldn't get the detailed information they were looking for, so they would go into a shop to ask questions. This formed the backbone to how we have built out the customer focused content on our site. We thought that if we can answer all their questions at the research stage, they have no reason to leave us. So to start we built out Q&A content across all of our products which we continually update. In practice this equates over 100 new Q&A questions that we answer for customers every week. We have also built out content like our Top 5 pages which allow customers to easily and quickly see our top picks for the category. For users just starting their research this can be a great place to start. We have discovered that if we are the source of information at the research for customers, they will come back to us when it comes time to purchase their product. CK: I've noticed that you have product videos across almost all of your products. Was this an extension of trying to assist at the research stage? ML: Absolutely. One of the things you can do in store that you can't do online is touch the appliances. We use video to try to address some of the questions that can only be answered by opening the appliance up and seeing how it works. This has been incredibly successful and we now have a policy of filming every single new product as we have seen the impact it can make on sales. We have also worked to pull the product videos on to the main category level pages. We did some testing and learned that a number of users didn't realise we actually had video reviews of the products. As a part of this process we also increased the size of the video thumbnail, made sure that users could tell it was a video, and spend the extra time and effort to make the still of the film the reviewer's face rather than our logo. These changes meant a 40% increase in the number of people who watch our product videos when they come to the site. Snapshot from the Integrated Washing Machines category level page. CK: So is user testing a major factor in your digital strategy? ML: I can't stress enough how valuable user testing is. Everything that we do as a team evolves around our customers, what they need, what they like, and how we can build a website that works better for them. This has really shaped how we create content and the value it provides for our business. We didn't build out better landing pages because of search updates, we built them out because it would make the experience better for our users and increase conversions. The fact that Google prefers sites with rich content is a fantastic bonus for us! CK: Could you tell us a bit more about how SEO fits into your plans for building a great site for users? ML: We believe that everything is interconnected. While our content isn't created solely for SEO, the SEO team do influence all the technical elements of the site that help ensure we are making the most of our content and that users can find it. On the outreach side of things, a great relationship with our clients means that we can be extremely proactive on social media. Great social media can allow for great outreach for SEO. To help ensure the SEO team are able to get things done, we have fully integrated them into the marketing team and we make sure that they have access to the resources they need to help ship things quickly. We also allow them to be creative and encourage them to come up with innovative ideas. CK: It sounds like you put a lot of time into building out a strong team? ML: I really believe that our investment in great people and building up a collaborative environment has meant that the team are always excited about coming to work. That can make a huge difference to how people work together and the speed at which we are able to run. We know that we are in a competitive space, but I don't worry about it too much as I know that I have worked hard to build out a fantastic team that love what they do. CK: Even with a very smart and passionate team, one of the biggest challenges we've seen in the SEO industry is getting technical or large scale changes rolled out. Your site seems to evolve constantly, how have you managed to overcome the hurdles that can some time block or delay these type of changes? ML: We have worked very hard as a company to make sure that it can't just be the marketing team that cares about making the website better for users, it has to be the whole company! A while back I undertook some user testing on a particular area of the site. I then took that research and instead of giving it to the marketing team to review, I had other people across the business review the videos and provide me with suggestions on how we could make the site better for customers. This meant that the very people who can sometimes hold up change were the ones recommending it as they could see first hand the impact it would have on the customer's experience. This provided a great step change within the company and helped ensure everyone was on board with the changes being made. CK: There is a lot of talk at the moment in the retail space about changes to Google Shopping and the fact they now require companies to pay to be included in the Shopping results. How do you feel about this change? ML: We see the change to Google products as a good thing as it levels the playing field and helps ensure that the results come from reputable sites. Anyone can set up a website selling washing machines, but you have to have a sustainable, well liked, and customer focused business to make it worth paying to appear in the results. While it is a bit annoying to have to pay this Google tax, ultimately it is not a bad thing for our business, with out ratings and repeat custom we are happy to pay for people to find us through Google Shopping. CK: What are your plans for the future? ML: Well we have a very busy year ahead of us with very ambitious targets, including conversions in the double digits (sorry I can't say the exact number). This means a continued investment in great content on the site and ever improving product and category level pages. Next year we are going to focus even more on our Brand based search results, as this is an area where I think we can still improve.